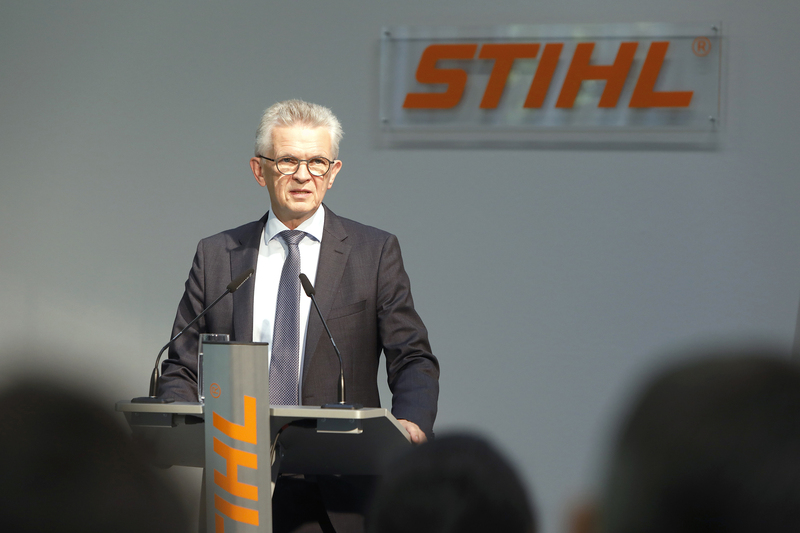 "Despite unfavorable weather conditions and the strong euro, STIHL Group sales were slightly higher than the same period last year", reported STIHL executive board chairman Dr. Bertram Kandziora at the company's press conference on September 18. Gasoline products in particular produced positive results. "This shows that our traditional gasoline-powered products are an important mainstay and will remain so in the long term", stressed Dr. Kandziora. But garden tools, especially cordless lawn mowers, also recorded above-average growth. The company achieved a turnover of EUR 2.65 billion in the period from January to August 2018. This represents a minor decline of 1.7 percent. Had foreign exchange rates remained unchanged, the successful sales results would have shown a 4.1 percent increase in turnover compared to last year. However, the conversion of currencies in STIHL's major world markets – primarily the U.S. and Brazil, too – resulted in a lower turnover due to the relatively strong euro. In addition, growth was slowed by the shorter vegetation periods brought about by the long, cold winter and the very hot summer, particularly in Western and Central Europe and also North America. Compared to the same period last year, the STIHL Group increased its unit sales slightly in the past eight months. "With the exception of North America, almost all key markets now are above prior-year", explained STIHL's executive board chairman. In Western Europe, unit sales have risen significantly after a long winter. This growth has been driven by a strong demand for STIHL cordless products in particular. The company has recorded a double-digit increase in sales in Asia and Africa. In Western Europe, there was greater demand for STIHL chainsaws and STIHL cordless lawn mowers, which were launched at the beginning of this year as part of the brand change. Sales of STIHL cordless lawn mowers have more than doubled. The STIHL executive board chairman pointed out: "This considerably exceeded our unit sales expectations in cordless mowers. The favorable response from our customers shows that we are pursuing the right strategy with the changeover of the green VIKING product line to the STIHL brand name that is well known throughout the world. We expect the brand change to significantly boost unit sales in 2019". The number of employees in the STIHL Group has increased further. As of August 31, the worldwide workforce totaled 16,928, which is 11 percent more than last year. STIHL had a good start in the German market this year. Unit sales of gasoline chainsaws, cordless products and robotic mowers were favorable. This trend was helped by the springlike temperatures at the beginning of the year and the summerly temperatures from April onwards. "The prolonged drought in many parts of Germany then began to have an effect. The situation was similar to that of the summer in 2003", said Dr. Kandziora. In spite of the extreme weather it was possible to achieve a turnover over the previous year's level. "Providing the autumn weather remains favorable, we are confident that we will regain the momentum that we had at the beginning of the year. To this end we have prepared strong campaigns, such as the "Super Saw Weeks", said the STIHL executive board chairman. The turnover achieved by the German founding company, ANDREAS STIHL AG & Co. KG, increased by 6 percent to EUR 804 million in the first eight months of this year. The number of employees was also up. "We were able to fill many vacancies that we had advertised, mainly in the areas of cordless battery products, electronics, connected products and IT", said Dr. Kandziora. As of August 31, the founding company employed 4,957 men and women, which represents an increase of 8 percent. Of that total, 3,885 work in Waiblingen, 265 in Ludwigsburg, 737 in Prüm-Weinsheim and 70 in Wiechs am Randen. Apart from that, 168 temporary staff were given unlimited contracts of employment in the period between the beginning of the year and the end of August. The company is also investing heavily in training its own skilled staff. STIHL will increase the number of new apprenticeship places from the current 75 in 2018 to 104 in 2019. Last year the company already boosted the intake of new apprentices for the year 2018 from 60 to 75. That amounts to an overall increase of 73 percent within two years. In addition, STIHL offers a new apprenticeship for those wishing to specialize in information technology. "Our highly committed staff are the foundation on which our business success is built. Our efforts in training and investments in our own skilled staff give us the strength to continue growing in the future", said the STIHL executive board chairman. Last year the company established new fields, structures and working methods in order to expedite the development of STIHL Products with digital functions. "This work is now bearing fruit. We have developed intelligent solutions and connected products in the areas of Smart Garden, Smart Forest and Smart Landscaping which make the work with and in nature and the home garden even easier for our customers", announced Dr. Kandziora. For the Smart Garden, STIHL offers an intelligent system for garden irrigation and a robotic mower – both can be controlled via an app. In the area of Smart Forest, the company has devised virtual and augmented reality concepts for product training and developed the world's first gasoline chains with sensor controlled fuel metering. The new LogBuch software - a Forst 4.0 pilot project – offers users in forestry an intelligent solution for the geo location of an object, a tree, for example. The stored data is transferred to the web-based LogBuch system, in which verbal notes are automatically converted to text and the information on the corresponding geo points is shown on a digital map. STIHL connect pro is the name of a cloud-based solution being developed for efficient fleet management on a digital basis which provides benefits for horticulturists and landscapers as well as municipalities. "Furthermore, we already offer horticulturists and landscapers the MemoMeister software solution, a communications and organization platform which considerably simplifies their work", said Dr. Kandziora. MemoMeister is a product of the startup Freiraum, in which STIHL has had a stake since the beginning of the year. Gasoline chainsaw: STIHL presented the world's first chainsaw with electronic fuel injection to be built in series, the MS 500i; it will be available from dealers in 2019. The injection technology enables the saw chain to be accelerated from 0 to 100 km/h in only 0.25 seconds. The power to weight ratio of 1.24 kg/kW has not been matched by any production chainsaw up to now. "The saw, which we presented as a prototype last year, features exceptionally easy starts and instantly delivers optimum engine power", said Dr. Kandziora. Smart Garden Hub: Using the new STIHL GCI 100, a sprinkler installation becomes a smart system. Intelligent technology controls the irrigation of home gardens and large areas like parks and sports grounds. The Smart Garden Hub is operated via an app for a smartphone or tablet. Water consumption can be reduced by up to 50 percent. The intelligent system can identify certain products of other manufacturers via the cloud and link them up to form a network. Cloud-based system solution: STIHL connect pro enables professional users in municipalities or landscaping companies to digitally manage machines and jobs. The sensor on the device – the STIHL Smart Connector – records operating hours and transmits them via the user's smartphone or tablet to the STIHL Cloud. Users receive via the STIHL connect pro portal a detailed overview of the status of their machines and relevant data, such as the type of job and job duration or upcoming machine maintenance work. This ensures better coordination of machine deployment and daily work flow. Robotic mower: In the course of the brand change, the STIHL iMow RMI 422 PC robotic mower will complement the STIHL product line as from spring 2019. Thanks to the iMow app, users can control the mower from their smartphone or tablet. An optional feature enables the iMow to take into account data from the weather forecast when planning its mowing times. Cordless lawn mower: The company presented the prototype of a new cordless lawn mower for professional landscape maintenance in noise-sensitive areas: the STIHL RMA 765 V. It has a giant cutting width of 63 cm and, thanks to the zero turn function of the front wheels, is highly maneuverable. The maintenance-free EC motor guarantees a long service life. The mower is powered by a 36V lithium-ion battery from the STIHL PRO cordless system. Cordless hedge trimmer: STIHL has added a lightweight hedge trimmer to its COMPACT cordless system, the HLA 56. A variable angle cutter bar allows the user to cut overhead, vertically and close to the ground. Pressure washers: The four newly developed STIHL RE 100, RE 110, RE 120 and RE 130 PLUS pressure washers are suitable for a wide variety of applications, ranging from car washing to cleaning jobs in the backyard. All four models belong to the robust compact class with an operating pressure of up to 135 bar and feature a high quality rotary nozzle for exceptional cleaning power. The new RE 90 is a light and compact entry-level machine with a particularly attractive price/performance ratio. For first time ever the world championships of the STIHL TIMBERSPORTS® Series will be held in the United Kingdom: The international final of the premier competition in lumberjack sports will take place in the Echo Arena in Liverpool on October 19 and 20. The world's best athletes will clash in team and individual events to find the 2018 world champions. Last year the lumberjacks from New Zealand carried home both the team and individual trophies. The Chairman of STIHL's Executive Board, Dr Bertram Kandziora, can look ahead to the future with confidence: cordless products, digital solutions and the brand change from VIKING to STIHL are giving the company a boost. Chairman of STIHL's Executive Board, Dr Bertram Kandziora, presents smart solutions at the press conference in Waiblingen. The STIHL MRI 422 PC robotic mower can be controlled using an app. Chairman of STIHL's Executive Board, Dr Bertram Kandziora, at the press conference in Waiblingen.